Smelly mucus in your nose can be due to many factors like infections and allergies. It usually resolves itself, but if it persists, see a doctor soon. 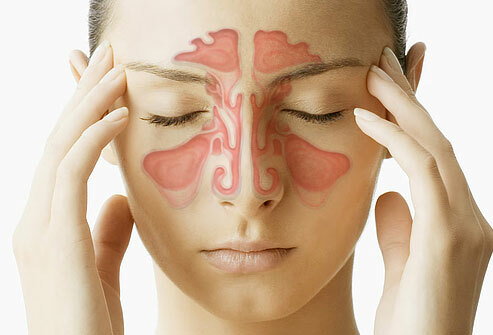 Smelly discharge from nose is a common condition, but may be an indication of a sinus infection. Furthermore, an unpleasant-smelling thick discharge with a foul taste could be a sign of chronic sinusitis. However, it is possible to stop this smell and ease your symptoms with the correct treatment. What Causes Smelly Mucus in Nose? The sinuses are air-filled cavities situated behind the forehead, eyes, cheekbones and bridge of the nose. They filter the air breathed in, using mucus to trap any dirt, bacteria, or other potentially harmful particles. The mucus passes from the sinuses to the nose and throat, where it leaves the body. During infection or allergic reactions, the sinuses become inflamed, and cannot effectively drain the mucus from the head. This may lead to an unpleasant-smelling bacterial infection. If these symptoms persist for three months or more, this could indicate a chronic sinus infection. Acute sinusitis is temporary and is usually due to catching a cold. Patients with acute sinusitis may also develop fever. With chronic sinusitis, the symptoms last for longer, and you may feel increasingly tired. When the sinuses do not produce enough mucus, the mucus thickens, which makes it difficult to clear from your head. Thick mucus accumulating in the sinuses and the back of the throat is known as post-nasal drip. This allows bacteria to build up, which may produce bad breath. Thus post-nasal drip can also lead to smelly mucus in nose. Post-nasal drip is a secondary condition that may be a consequence of rhinitis, sinusitis, gastroesophageal reflux disease or swallowing disorders. Acid reflux and heartburn may also contribute to the development of post-nasal drip. 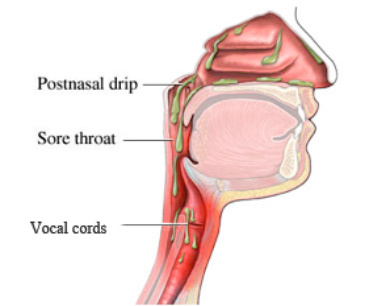 Symptoms: The symptoms of post-nasal drip vary, but often include coughing, sneezing, difficulty breathing, pain or irritation in the throat, frequent need to clear the throat and the development of small yellow/white masses in the back of the throat, known as tonsil stones. Treatment: As post-nasal drip is often a result of other health ailments, it can be treated by targeting those primary conditions, for example, using allergy medications or antibiotics. You can ease the congestion by drinking lots of hot drinks and soups to flush out the mucus. Gargling with salt water may also help. Rhinitis is the inflammation of the nasal passages, which can cause a runny, smelly discharge from the nose. Other symptoms include itching and frequent sneezing, as well as a general run-down feeling. Rhinitis can either be temporary, usually caused by an infection or an allergic reaction, or chronic, where the symptoms last six weeks or more. Symptoms: Allergic rhinitis may be caused by seasonal allergy to pollen, a condition commonly known as hay fever, or the patient may suffer all-year round due to allergies against dust, mites, and animal proteins. During an allergic reaction, the body produces excessive histamine, which causes fluid to leak from the blood vessels of the nose into the surrounding areas, resulting in a smelly nasal discharge, itching, swelling, and watery eyes. Treatment: Treatment for rhinitis depends on the cause. Infectious rhinitis will usually clear by itself, but you can speed the process by resting and taking vitamin C to fight the infection. With allergic rhinitis, you may be able to identify the allergen yourself by trial and error, or your doctor can perform an allergy test. You can then avoid exposure to the causative agent, or if this is not possible, take anti-histamine tablets. What to Do with Smelly Mucus in Nose? To diagnose sinus infection, your doctor will conduct a medical history and perform a physical examination. He or she may also take an X-ray or CT scan of your head if you are not responding to the initial medication. Drugs are usually the first treatment choice for sinusitis. Decongestants will allow the smelly nasal discharge to clear and will ease the swelling in the sinuses. Your doctor may also recommend steam treatment or inhaling the vapor from a hot shower to loosen the mucus. If the symptoms continue for more than 10 days, you could be prescribed antibiotics. In rare cases, surgery may be performed to allow for adequate drainage from the nose. To treat your illness at home, make sure you take lots of rest to allow your body to recover. You’ll also need to drink plenty of water and fruit juice to dilute the thick smelly mucus and stimulate drainage. However, avoid drinks containing caffeine or alcohol, as these can dehydrate you and cause the sinuses to swell further. Some people find that applying warm pads on their nose, cheeks and eyes eases the pain and swelling felt from sinusitis. In addition, keeping your head elevated while you sleep can help to promote drainage and prevent that stuffy feeling you get when you wake up. Finally, try using a nasal lavage to wash out your sinuses. Prefilled containers, such as Sinus Rinse, can be bought from your local pharmacy, or you can use a bulb syringe or neti pot and fill this with sterile, filtered water. Mix in ¼ to ½ teaspoon of salt and a pinch of baking soda. Tilt your head to the side over a sink, and squeeze the solution into your upper nostril. The liquid will flow through your nasal passages and out your other nostril or your mouth. Repeat on the other side. When you’ve finished, rinse the irrigation device with contaminant-free water and leave it to air-dry.